I would like to wish everyone a happy and healthy new year in 2016. May all of your new year resolutions come true! This headend has an analog-only lineup that only goes up to channel 99, with no digital Clear QAM or HD channels whatsoever. There aren't even digital set-top boxes with interactive TV guides, at lease not anymore because Charter discontinued the >100 channel lineup in Grand Coulee back in '08. I guess it makes sense as to why Charter still has TV Guide equipment, but still, it's kinda interesting how this is probably one of the very few headends left that still use the equipment even long after Pop rebranded from TVGN. So um.....this happened. 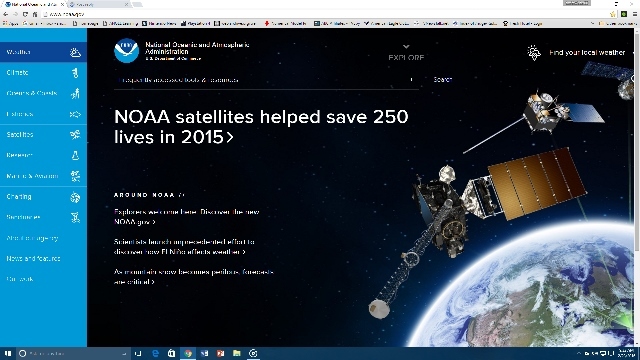 I forgot noaa.gov was getting a site redesign. It looks really nice and clean. That does NOT resemble a government site at all. I hope their other sites won't follow suit. They actually updated it not long before this, and the design matched in general with weather.gov and other NOAA sites. I know there are some baseball fans here could someone ID this song? We had a lot of hail yesterday, I apologize for the quality not being that great. I was caught off guard on how bad this storm was going to be so as soon as I went out in front of one of the windows on my back porch I hit record. The hail and wind actually got a little worse after this, but my memory on my SD card ran out so I couldn't record it. Time to put away the Pot Belly Stove until Fall of 2016. What is the Pot Belly Stove?